Here's a list of the most frequently asked questions by our customers, when they outsource finance and accounting services to Outsource2india. In case the question you are looking for is not answered below, or not addressed satisfactorily, please feel free to contact us. 1. How can I outsource finance and accounting services to O2I? 2. 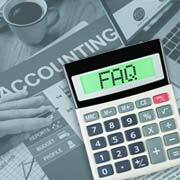 Why should I choose Outsource2india to outsource finance and accounting services? Read more about the benefits of outsourcing finance and accounting services. 3. Do I have to outsource my entire project, or am I allowed picking certain tasks that I want to outsource? You can either choose to outsource your project entirely, or certain tasks. Once you forward your requirements, we will build a custom workflow and assign a team to work on your specific requirements. 4. Do you have any experience in finance and accounting services outsourcing? Outsource2india is a pioneer in offering finance and accounting services, and has been providing finance and accounting outsourcing solutions to global customers across diverse industries since 2002. 5. Do you use any finance and accounting software? In case your organization uses different finance and accounting software, we have the skills and expertise to work on the software of your preference and employ it effectively for your finance and accounting services. 6. What is the skill level of your finance and accounting services team? At O2I, we are proud to have the best talent on board. Our finance and accounting services team comprises of skilled and well-trained accountants, chartered accountants, and financial experts experienced at using the latest finance and accounting software. Additionally, we use IFRS and GAAP standards and follow US Patriot Act. 7. I am very particular about the security of my financial data. Do you follow any data security measures? We take data confidentiality, copyright, and privacy very seriously, and ensure that any client related information is not published, distributed, sublicensed, sold or disseminated to third-party at any cost. Additionally, we make our employees sign confidentiality agreements, service-level agreements, & non-disclosure agreements at the onset of every project to ensure complete safety of our clients data. Read more about our Financial Data Security Policies. 8. Do you have the required infrastructure and technology to offer Finance and Accounting Services? At O2I, we have world-class infrastructure and high-end technology to help us deliver cutting-edge finance and accounting solutions to our global customers. Find out more about the infrastructure and technology at O2I. 9. What are your working hours? Our usual working hours are from Monday 7.30 PM EST (6 AM IST) to Saturday 3.30 PM EST (2 AM IST). But, we are open to do work on weekends if informed about the same by Thursday evening or Monday morning. 10. What is your turnaround time / how long does it usually take to complete a project? Quickest turnaround time is the USP of our finance and accounting services, and we guarantee 24 hours TAT in most cases, as we have the expertise and skills to complete large volumes of work accurately and efficiently within the smallest time frames. However, the project completion time depends on a number of factors like project size, type, complexity, urgency, etc. Once you send us your specifications, we can update you with the exact time to complete your requirements. 11. What is the best time to contact you? We leverage the best communication technology to ensure that our finance and accounting services team is constantly available over phone, e-mail, Skype, and chat to answer your queries and address your requirements at all times. 12. What is your pricing structure? Please contact our team with your specifications for exact quote. 13. What are your payment modes? We accept payments through PayPal, Credit Card, Check within the USA, and Wire Transfer. 14. Do you do provide free trial? We provide a free, no obligation 5 day trial to demonstrate our capabilities. 15. Can you provide a demo? Yes. If you have a PC camera, we can schedule a live meeting demo at your preferred time. Simply contact us, and our representatives will make all the required arrangements. Find out more about O2I's Financial Software Solutions and contact our executive for additional details.